If your looking to have your nose operated to improve a cosmetic or functional problem that wasn't properly corrected or occurred from your primary surgery, then you are considering a revision rhinoplasty, or secondary rhinoplasty. Some nose surgeons will correct a minor cosmetic defect at no charge if they did the surgery. However if your problem is much more serious then being upset about a very minor cosmetic change then you will have to do a lot of research and see top specialists in determining what is the problem and how it can be corrected properly. That is one of the reasons i put this blog together. As a resource and to pass on my experience as a nose patient. In my first post, i mention revision nose surgeons who have experience with rib grafts. I also have listed different websites you can link to for more information. There is no perfect nose surgeon, just have to find the right one who has experience correcting the problem you want corrected. If you need to travel outside your city or Country for someone who is more of an expert, then you should do so. Never settle for someone who simply say's they can do the surgery, and they can do what the other top experts promised you. Never underestimate the complexity of rhinoplasty especially revision rhinoplasty, its very challenging and specialized. Never underestimate what could go wrong either. I would of never thought i could end up with neuropathic permanent pain from nose surgery, but i did. You could also end up with serious condition called Empty Nose Syndrome. I have this to mild degree on my left side nostril. 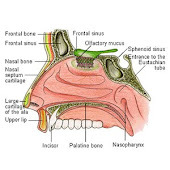 This occurs from removal of too much turbinate tissue. Just because the nose is relatively a small part of your anatomy, doesn't mean a serious side effect can't occur from the surgery. Take the surgery very seriously, its your body and only trust someone you feel absolutely comfortable with and has the experience and /or knowledge to fix your specific problem. If your uncomfortable with the surgeon and you are not getting a clear outline about what the surgeon plans to do with your nose then you may want to look elsewhere. If you are having doubts about their experience or approach to the surgery , that is a serious red flag. Don't expect a surgeon to change their approach because its not in line with what you think is right for yourself. . It's not likely going to happen, and it will likely lead to great disappointment after the surgery.